Bear Brook turned out to be a bit of a mess. I got my miles in, and that’s all I really needed to do. Still the experience wasn’t what I was looking for. The race was scheduled to start at 6:30 in the morning. I set the alarm for 330 so I’d have time for the hour-and-a-half drive to the park. Unfortunately, I woke up a little before three, so when I got in the car I was operating on even less sleep than I had expected. After a side trip to a 24-hour Dunkin’ Donuts for coffee and some food, the ride to Allentown, New Hampshire was uneventful. But when I got to Bear Brook Park, I couldn’t find the snowmobile parking lot where the start was supposed to be. It wasn’t on any maps, and the only instructions the race director gave us were to “look for signs”. There were none. I wasn’t the only person driving around the perimeter of the park looking for the snowmobile lot. Luckily I had allowed extra time, so when we finally found the cut out leading to the parking lot, there was still plenty of time to get ready for the race. There were actually two races going on today. I was signed up to do one marathon–length loop through the woods, while other people planned to run a two-loop 53–mile ultramarathon. 158 runners had registered for the race, most of them in the marathon. We were warned that it was a bad year for deer flies. I planned on wearing my shade hat, figuring the flap would help keep the bugs away from my ears and the back of my neck. A company called Tred-Not donated some of their deerfly patches so everyone could try one. Deerflies tend to buzz around your head and land a few times before they bite. The patches are essentially strips of two-sided tape. The idea is that you stick a strip to your hat and when the deerfly lands it gets stuck. I also wiped on some Deep Woods Off, then I put on my body glide, strapped on my dual-bottle waist pack, popped a Celebrex (my stomach can’t take ibuprofen anymore), and went to the starting line. We went off on time at 6:30. It was a good day for a midsummer race. The temperature was in the upper 50s at the start, rising to the upper 70s by the end of the race. By mid-morning the sun was uncomfortably strong, but for the most part we were running in the shade where the temperature remained relatively cool. I had one problem right at the start. 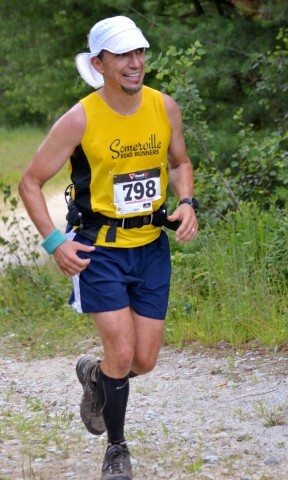 I had last used my old waist pack in 2005, at the Vermont 100. When I started running I was surprised to find that the elastic was worn out, so my full water bottles bounced around uncomfortably, ready to fall out at any moment. I ended up tying one bottle snugly into its pouch and carrying the other, so when one ran dry, I had to stop and swing the belt around to change them. After I figured out how to deal with the water bottles, the race went well for the next 18 miles or so. I wasn’t in any particular hurry, so I trotted along comfortably, running the flats in the downhills and walking the uphills like I would if I were running an ultramarathon. The trail was marked with a mix of pink ribbons, red flags, and little yellow signs with black arrows. Nothing terribly scenic, just pleasant forest trails, which made it easier to concentrate on what I was doing. It wasn’t an easy course, but for a trail, it wasn’t that hard. There were a few good hills, but not many of them and no real mountains. About 80% of the course was runnable, with plenty of rocks and roots, but not so many that you couldn’t keep your footing. There were some excessively rocky parts, and in spots there were deep ruts from ATV traffic. I tripped a few times, but I only fell once, and that wasn’t a full face plant, more of a tuck and roll that left me with a bruised hip and a mild scrape on my elbow, but nothing serious. One good solid kick to a rock left me with a tender big toe. I knew I was going to lose the toenail, but that wasn’t a big deal either. When I reached the second aid station, just before the 11 mile point, Ryan, the race director was there asking runners if they felt the course was marked properly. I thought that was an odd question for him to be asking. If Ryan had any doubts about how the course was marked, he should’ve put out more markers. But up to this point the course had been well marked, better, as I told him, than the marks guiding us to the parking lot. Somewhere after the 18 mile point, I started to smell the finish. I still didn’t want to race, but I felt good so I was thinking about picking it up a little bit and seeing whether I could catch anyone, just to keep myself occupied for the last 8 miles. The trail I was running on was crossed by a road, and as I stopped to figure out which way to go, a woman pulled up next to me. We saw two sets of pink ribbons, one straight across the road and one up the road to the left. We looked past the one across the road into the woods and saw another ribbon farther down the trail, so we headed off in that direction. That was the wrong choice. There were markers on the trail we picked, but they were few and far between. Still that wasn’t uncommon when the trail was clear, so we kept going. But after about a mile and a half we came to another road and found a group of much faster-looking ultrarunners standing there, trying to figure out what to do. They told us we had all gotten off course, and at the moment, we were only a mile or so down the road from the first aid station, at mile six. One of them had a phone. They had called Ryan, and apparently Ryan had made a mistake marking the trail before the race, and he hadn’t taken down all the bad markers. No big deal. When you run a trail race, you have to expect a few bonus miles here and there. I was actually mildly pleased because I had been considering running a few extra miles at the end of the race, and now I wouldn’t have to. Runners kept pulling up while we talked. We decided to head back the way we had come, back to the last road where we could follow the alternate set of markers. For a while I could see the faster runners ahead of me, turning even more runners around. Then they pulled out of sight. Unfortunately, the group running at my pace failed to backtrack correctly. We never found the road. Instead, we ran until one of us noticed a familiar sight, some tree stumps with rocks piled on top of them. We had somehow gotten back on the course, but early on, only about 5 miles into the loop from the start. Some people were ready to give up. They wanted to continue back along the well-marked portion to the start. I was part of the group that wanted to keep trying to get back on the course where we had gotten off, in order to complete the loop and avoid disqualification, so we truned around to try to find the turn we’d missed. It wasn’t about getting a good finishing time for the race – we had already wasted quite a bit of time. It was about getting the satisfaction of resolving the problem and completing the loop the way we were supposed to. We kept running, and we kept finding more little packs of lost runners. 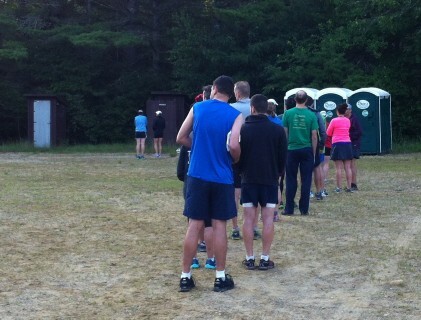 At each meeting, runners would shuffle groups, some taking the sure route back to the start, others wandering on. Finally, the main group of strivers decided to head back to the road where we first figured out we were lost and go to the aid station to ask them for a route back to the course. Since that had already failed for the initial group of fast people, I turned again and headed back by myself to the known route to the start. Before giving up totally, I made one last attempt and took a path we hadn’t tried yet in the hope that it would cut cross-county to where I belonged. Not a good idea. After three-quarters of a mile on the side trail, I gave up, ran back to the course, and turned toward the start. When I looked at my GPS trace after I got home, I saw that I’d actually gone directly away from the path I was trying to find. Oh well. 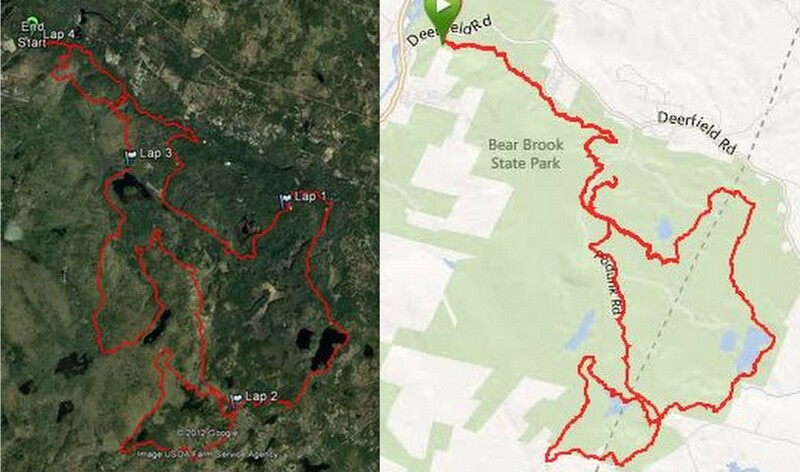 Lesson learned: next long trail race, study the map more carefully ahead of time. The intended course and the course I actually ran. Click on the map to play back my GPS trace. Start it at mile 18 and watch. It’s funny. I had now run about 23 miles. I knew that I was on the course somewhere before the first aid station at mile six, so I figured I had to run around 5 to get back. They weren’t easy miles. It’s one thing to be rolling into the finish after a nice long run, knowing you are on track and knowing how far you have to go. It’s much more depressing to be dragging your way back however you can after getting lost, not quite sure when you’ll be able to stop running. It was a good thing that I’d been running in ultra mode the whole way, otherwise I might have run out of gas. At least I was pretty sure I’d get back. The markers were there and every once in a while I’d see an ultrarunner, one of the few who hadn’t gotten lost, coming the other way as they worked on their second loop. It was also a good thing that I’d topped off both water bottles back at mile 15. Even so, my fluids ran out at mile 28, but it was only about a half-mile more before I made it back and received my prize for finishing. We had been told that “ALL finishers will receive an awesome and unique finisher’s award”, so the water bottle with the Bear Brook emblem was a little disappointing. My GPS says I finished my 28.5 miles in 6:02, with a marathon split somewhere around 5:30. I had cut off a big loop of the course, but all the back and forth trying to get where I was supposed to be added more than enough to make up for that. Very few people completed the loop without getting lost. Most of the ultrarunners dropped after one loop, since they’d already run 5 or 6 extra miles and they had no guarantee that they wouldn’t add on more before they were done. Ryan was wandering around blaming “vandalism” for the problems with the markings. One thing he wasn’t doing was apologizing, though others on the race team did express their regrets. Whatever. I don’t know how Ryan will sort out the results. Normally, anyone who goes off-course and doesn’t get back on where they left is disqualified, but today that would be almost everyone. But with so many people running odd distances trying to find their way around, the times don’t mean anything. One last indignity: Unfortunately there were no instructions in the bag to go with the deerfly strips. Apparently I attached mine backwards, so the super sticky bug trapping side was stuck to my hat. The strip didn’t catch any bugs, but there’s hope for next time because the strip left a thick layer of glue behind when I pulled it off my hat. The day wasn’t a complete failure. I made it out of the woods after running all the miles I wanted (and more). I’m horribly tired, but that’s just lack of sleep. My feet feel like I’ve been jumping up and down on pointy rocks for six hours, but I don’t have any serious injuries. I even made it through more than 28 miles on the trail without any blisters. I’ll trade a toenail for a blister-free run any day. But I still don’t think I’ll be going back to this race next year. Pingback: CCM Diary: Uncaged! « Y42K? is “an awesome and unique finisher’s award”. Sounds like a mess all around. It’s a good thing ultra runners are such an easy-going, laid back group – otherwise Ryan might have found himself hanging upside down by his toenails with those little flags poking out of him! Ray, I like you did Bear Brook, but I have to say, that although I wasnt quite as fast as you, my impression of the race is different, in that I found the grass-roots low key approach to the race refreshing to some of the uptight types I had run recently. And although their was the one section of the course that was vandalized the group of 5 or 6 that I had run off and on with during the course, none of us did get lost. But to each to his own, and as you said at least you got 28 in without a blister. Personally I think that I will run in next year, to allow Ryan to work out some of the kinks.